The sounds of psychedelia’s peak from 1967 and going into 1968 have been well documented. Whether delving into the classics of the era or digging for obscurities, there are a wealth of great tunes to be found within an eighteen month period. 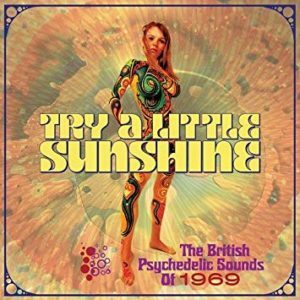 By 1969, the musical tide was very much turning; British whimsy and three minute pop gems about myriad cups of tea and talking gnomes had largely been pushed aside for harder rock sounds. Various bands clung on for dear life, of course, and even well into 1969 there were bands across Britain knocking out various 7” pieces of plastic for the psychedelic cause. In another volume of musical history, Grapefruit Records have dug deep to bring three discs of interesting cuts from the year. The results are quite often less gaudily coloured, but you’ll still find a few bands sticking to familiar formulae. While at least half of the material gathered here is more of the well-honed pop/rock variety than flat out psych, the journey is one that’s still more than worth taking. Covering over seventy tracks in all, such a box set could seem daunting, but the curators have included at least ten familiar names, which actually adds to the commercial appeal without detracting from the potential obscurities and rarities.